Objective: To evaluate the diagnostic efficiency and accuracy of contrast-enhanced transcranial color-coded sonography (CE-TCCS). Background: TCCS is hampered by insufficient ultrasonic penetration in 20% of cerebrovascular patients. Methods: In 47 patients whose basal arteries could not be assessed adequately, 59 TCCS examinations were performed before and after administration of the ultrasonic contrast agent (CA) Levovist. The assessability of different basal cerebral arteries after CA administration was evaluated off-line. Angiographic records were available from 11 patients. Results: Satisfactory investigation of the middle cerebral artery, the anterior cerebral artery, the P1 and P2 segments of the posterior cerebral artery, and the supraclinoid portion of the internal carotid artery siphon was possible in 5.1%, 28.8%, 35.6%, 55.9%, and 47.5% of patients before, and in 84.7%, 91.5%, 93.2%, 94.5%, and 93.2% of patients after contrast enhancement. Stenoses or occlusions of basal cerebral arteries were registered in 28 patients (60%). CE-TCCS diagnosis was confirmed by digital subtraction angiography or magnetic resonance angiography in 10 of the 11 patients, leading to positive and negative predictive values of 0.86 and 1.00. Conclusion: Contrast enhancement improves the diagnostic potential of TCCS significantly in patients with temporal bone window failure, and proved to be a reliable method for detecting middle cerebral artery and siphon occlusion. The aim of this study was to evaluate the diagnostic usefulness and accuracy of contrast-enhanced transcranial color-coded sonography (CE-TCCS) in a broad spectrum of cerebrovascular patients who had been referred to the neurosonologic laboratory of our university. Contrast enhancement was brought about by an IV injection of 2.5 g Levovist (Schering, Berlin, Germany; 300 mg/mL). In contrast to previous studies, we investigated a collective with a high rate of pathologic findings to demonstrate the potential and limitations of CE-TCCS under clinical conditions. From May 1996 to October 1997, 3,440 TCCS examinations were performed in our cerebrovascular laboratory. In 510 patients (14.8%) satisfactory evaluation of one or several basal cerebral arteries was not possible owing to ultrasonic attenuation by the temporal skull. In 47 patients the referring physician considered that it was extremely important to employ the entire spectrum of ultrasonic techniques available (including echo enhancement) to be as sure as possible of the appropriate course to take in further patient management (e.g., immediate thrombolytic therapy or anticoagulation). In these patients (mean age, 66.6 ± 10.7 years; 19 women, 28 men), 59 CE-TCCS investigations were performed by the same investigators (T.G., G.S., B.M., M.K.) that performed the nonenhanced TCCS. Initial examinations were performed immediately after the patients reached our department—in most cases, less than 12 hours after the onset of ictus. Follow-up examinations were conducted during the following 2 weeks. All patients had cerebrovascular diseases. Positive diagnoses for either galactosemia or severe heart insufficiency led to exclusion from the study. Extracranial color duplex examination (HP SONOS 2500, Hewlett-Packard, Palo Alto, CA; 5-MHz sector scanner or 7.5-MHz linear scanner) of the brain-supplying arteries was performed before the transcranial studies in all patients. TCCS was carried out with a 2.5-MHz, 90-deg sector transducer transtemporally in projection to the orbitomeatal line as described earlier.1 All visible arteries on the affected side of the circle of Willis were traced by pulsed-wave-Doppler analysis to detect spectral irregularities. Instrument parameters were optimized carefully to achieve maximum sensitivity for both the unenhanced and CE procedures. Contrast enhancement was brought about by a bolus injection of 2.5 g Levovist into the cubital vein. Levovist is an air-containing CA that consists of galactose microparticles. Addition of palmitic acid guarantees stability of microbubbles for several minutes, and their small diameter permits passage through capillary beds,3,6 which leads to a sufficient signal enhancement of the basal cerebral arteries for approximately 3.5 minutes.7 Each injection was followed by a flush of 10 mL saline. Overenhancement of color display (blooming effect) was reduced by lessening the insonation power and gain if necessary. If the arterial segment was classified as not visible, one had to consider whether this was due to vessel occlusion or Doppler signal attenuation. MCA occlusion was considered to have occurred if the M1 segment was not visible and the A1, P1, and P2 segments were sufficiently assessable, or the M1 segment was not visible and the supraclinoid part of the ICA (siphon) was occluded. The ICA siphon was considered occluded if the ICA siphon was not visible and the P1 and P2 segments were adequately assessable while extracranial Doppler analysis revealed either a typical high-resistance signal (“preocclusive signal”) with absence of diastolic flow as a sign for a distal obstructive process or occlusion at the origin of the ipsilateral ICA. PCA occlusion was concluded if the P1 and P2 segments were not visible and the M1 and A1 segments were adequately observable. Finally, ACA occlusion was presumed if the A1 segment was not visible, the siphon was occluded, and the P1 and P2 segments could be assessed adequately. All patients were investigated with cranial CT using 4 to 8-mm sections parallel to the base of the skull (SOMATOM plus S; Siemens, Munich, Germany). Hyperintense middle cerebral artery sign (HMCAS) as an indicator of MCA occlusion was defined as the presence of a hyperdense spot along the main trunk of the MCA according to criteria described elsewhere.11-13 In four patients, magnetic resonance angiography (MRA) records of the basal cerebral arteries were available (SP-MAGNETOM, 1.5 T; Siemens), and seven patients had received arterial digital subtraction angiography (DSA) of the extracranial and intracranial brain-supplying arteries. The number of sufficiently assessable arterial segments before and after administration of CA was compared using Wilcoxon’s matched pairs signed rank test. Significance was set at p = 0.05. Sensitivity, specificity, and predictive values were calculated from cross-tables. All injections were well tolerated without side effects or discomfort. The duration of the contrast effect allowed both imaging and sampling of frequency curves of all basal cerebral arteries on the affected side. 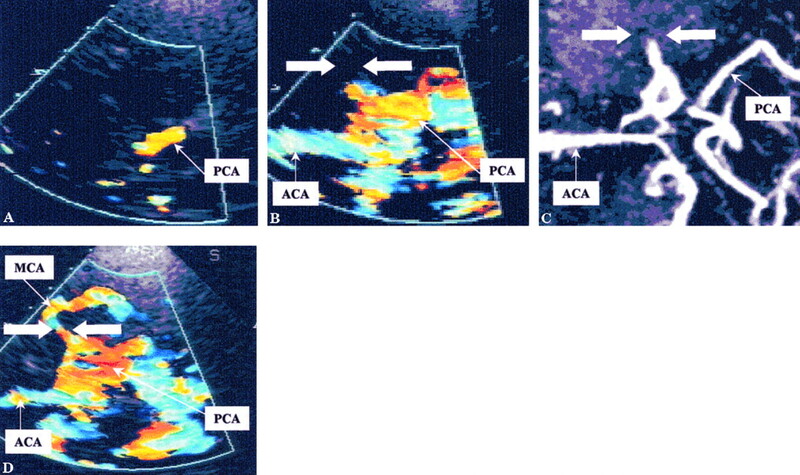 Figure 1 shows the percentage of sufficiently observable arterial segments before and after administration of the CA according to the investigation criteria described earlier. The M1, A1, P1, and P2 segments and siphon of ICA could be investigated in 5.1%, 28.8%, 35.6%, 55.9%, and 47.5% before CA administration, and in 84.7%, 91.5%, 93.2%, 94.5%, and 93.2% after administration of the CA. CE-TCCS revealed a significantly higher number of assessable arterial segments compared with unenhanced TCCS (p < 0.05; n = 59). Figure 1. Percentage of sufficiently assessable arterial segments of the circle of Willis before and after administration of contrast agent according to the observation criteria (p < 0.05; n = 59). M1, A1, P1, and P2 indicate segments of the middle, anterior, and posterior cerebral arteries. “Siphon” includes the supraclinoid part of the internal carotid artery. CE = contrast-enhanced; TCCS = transcranial color-coded duplex sonography. Initial CE-TCCS revealed pathologic findings in 29 of 47 patients (62%). Twenty-five of these patients showed clinical symptoms. In four patients, findings were made incidentally. In five examinations application of the CA enabled us to assess a reverse-flow direction of the A1 segment as evidence for cross-flow collateralization, which was not possible on native scans. In 18 of the 47 patients (38.3%), CE-TCCS revealed an occlusion of the M1 section (figure 2). Nine of those also displayed a siphon occlusion, and CT revealed HMCAS in 8 patients (44.4%) and complete infarction of the MCA territory in 6 of the 18 patients (33.3%). TCCS follow-up examination records were available in 13 of those 18 patients, of whom 10 (76.9%) showed M1 recanalization (table). In 15 of the 18 patients (83.3%), CE-TCCS diagnosis was confirmed by a sonographic diagnosis of recanalization, HMCAS, or both. Five patients could not be subjected to additional confirmatory TCCS follow-up investigations. Figure 2. Transcranial color-coded duplex sonography (TCCS) scans from a 64-year-old woman with acute hemiparesis exhibit insufficient transtemporal ultrasonic penetration. (A) Unenhanced TCCS was inconclusive. Only the P1 segment of the posterior cerebral artery was visible. (B) CE-TCCS shows overenhancement of color display (blooming) at the anterior and posterior cerebral arteries. Despite this intentional excessive enhancement, the middle cerebral artery (MCA) remains invisible—a typical feature of MCA occlusion. Arrows indicate the area occupied by the MCA. Extracranial color duplex of the internal cerebral artery revealed a preocclusive signal. Cranial CT on day 2 (not shown) revealed a complete MCA infarction. (C) MR angiography confirmed MCA occlusion (arrows). (D) TCCS follow-up examination on day 7 confirmed MCA recanalization (arrows) with slightly reduced peak blood flow velocities on the affected side (right, 63 to 26 cm/sec; left, 88 to 32 cm/sec). In 4 of the complete group of 47 patients (8.5%) an isolated siphon occlusion (MCA patent) was found, and in 1 patient was confirmed by the TCCS follow-up examination, which demonstrated recanalization. Eleven patients underwent arterial DSA or MRA. In 11 of 12 examinations (Patient 1 was assessed twice) CE-TCCS findings agreed with angiographic results, leading to positive and negative predictive values of 0.86 and 1.00. The sensitivity index was 1.00 and the specificity index was 0.83. In six patients, seven basal cerebral arterial stenoses could be detected sonographically. Angiographic findings confirmed CE-TCCS diagnosis for five of the stenoses. One patient did not undergo angiography owing to restlessness. In Patient 1 an MCA stenosis on the right side detected by CE-TCCS (segmentally increased flow velocities [systolic, 172 cm/sec; diastolic, 67 cm/sec] and high-energy negative frequencies) could not be confirmed clearly by MRA. Echo contrast enhancement is a promising tool for investigating intracranial hemodynamics in patients who cannot be examined by TCCS owing to temporal bone window failure. In vitro,3 animal experimental,14,15 and clinical studies4-7,16 have shown that Levovist is well tolerated and that it improves the Doppler signal intensity and the signal-to-noise ratio for several minutes. However, no studies have evaluated the usefulness and diagnostic accuracy of CE-TCCS in a routine clinical setting using a patient series with a high rate of pathologic intracranial findings. We selected a group of cerebrovascular patients who had been referred to our neurovascular laboratory from a large patient collective over a period of 17 months. The frequency of acoustic window failures during this period was approximately 15%, which was consistent with values reported in the literature.1,2,17 A subgroup of 47 patients with inconclusive transcranial diagnosis received a total of 59 supplementary echo contrast examinations. An adequate assessment of a segment of the circle of Willis was assumed if the whole course of an arterial segment was visible. When an arterial segment could not be seen, the question arose as to whether this was due to actual vessel occlusion or just technical problems. This problem could be solved by careful investigation of adjacent arterial segments in different projections and with optimized instrumental parameters. Vessel occlusion was concluded if all other segments could be seen to a sufficient extent. Furthermore, with MCA and siphon occlusion, extracranial duplex sonography frequently reveals “preocclusive” signals. TCCS has been proved recently as a valid method for detecting intracranial vessel occlusion by Kenton et al.,18 who found a high diagnostic agreement between TCCS and MRA. Nevertheless, as with other imaging methods, residual flow approaching zero with very low Doppler energy may rarely remain undiscovered. An adequate visualization of the insonated arterial segments was achieved in 5 to 56% of patients before administration of CA, and in 85 to 95% of patients after enhancement. Here one should note that on native scans the posterior part of the circle of Willis was easier to insonate than the MCA main stem. These findings comply with those of other investigators: Otis et al.4 and Bogdahn et al.5 performed CE-TCCS in clinical phase II studies on five and three patients with insufficient transtemporal insonation conditions and found adequate Doppler signal enhancement in all patients. Baumgartner et al.16 achieved complete visualization of the ipsilateral basal cerebral arteries in 0 to 13% of patients before and 69 to 81% of patients after contrast enhancement in 32 cerebrovascular patients who demonstrated insufficient ultrasonic penetration. Specifically, the ipsilateral M1, A1, P1, and P2 segments were completely visible in 13%, 0%, 6%, and 6% of patients before and in 69%, 69%, 72%, and 81% of patients after application of CA. However, their CE-TCCS study included patients mainly with extracranial occlusion and stenoses whereas patients with intracranial lesions were not investigated. Two previous nonimaging transcranial Doppler studies (clinical phase II studies) showed similar results. Rosenkranz et al.7 found that after contrast enhancement of 20 patients with insufficient Doppler signals from 30 M1 segments, 28 of these patients (93.3%) became assessable. Ries et al.6 examined 37 intracranial vessels in 20 patients with insufficient transtemporal insonating conditions and reported a sufficient signal increase in 32 of 37 patients (86.5%). The overall rationale for applying CE-TCCS in our study was that more precise and secure information on neurovascular status was needed for facilitating decisions to be made on patient management (e.g., clinical signs suggestive of occlusion of a larger intracranial artery, allocation to immediate thrombolytic therapy or anticoagulation, classification of stroke immediately after admission, critically ill or restless patients not able to tolerate or to cooperate during MRA or arterial DSA). This specific selection explains the fact that our rate of pathologic findings (60%) was higher than those of the other studies cited earlier. The high rate of MCA and siphon occlusions offered the opportunity to evaluate the reliability of CE-TCCS examinations. Arterial DSA as a gold standard could be performed in seven patients. In the remaining patients the general problem was to validate ultrasonic findings when the use of invasive diagnostic procedures could not be justified. As noninvasive alternatives, MR angiograms and TCCS follow-up studies were undertaken to show artery recanalization. The HMCAS in unenhanced cranial CT was also used because it has a high specificity (approximately 1.0) for suggesting MCA occlusion.11,13 A complete infarction of the MCA territory might also indicate transient or persistent MCA occlusion. We used MRA and DSA as reference methods and found a discrepancy in only 1 of 11 patients for whom the CE-TCCS diagnosis of an MCA stenosis could not be confirmed by MRA. However, this discrepancy may have arisen because MRA may also be limited in its diagnostic ability: When assessing MRA versus DSA (as the reference standard), Korogi et al.19 found a sensitivity of 0.88 and a specificity of 0.97 for MCA steno-occlusive lesions. Also for MRA, Stock et al.20 found that both sensitivity and specificity were 0.86 for detecting intracranial vessel stenoses. One must take into account that the peak blood flow velocities that we used for the diagnosis of intracranial stenoses are higher after application of CA owing to the better detection of high-velocity components and technical factors,16 which leads to higher velocities of stenoses detected by CE-TCCS. Therefore, and generally speaking, stenosis quantification based on Doppler measurement should be considered carefully. The difference between CE-TCCS and MRA in one patient with MCA stenosis may have been due to a limited sensitivity of MRA. If one accepts either recanalization or HMCAS as criteria to allow calculation of the sensitivity and specificity of CE-TCCS for detecting arterial occlusions, the results are even more striking in that CE-TCCS is a reliable diagnostic tool in acute stroke patients. The relatively short duration of contrast enhancement, approximately 3.5 minutes,7 currently is the main limitation of CE-TCCS studies. The authors are indebted to Mrs. A. Jahn for technical support. Seidel G, Kaps M, Gerriets T. Potential and limitations of transcranial color-coded sonography in stroke patients. Stroke 1995;26:2061–2066. Becker G, Winkler J, Bogdahn U. Transcranial color-coded real-time sonography in the adult. 1 : Normal findings and cerebrovascular ischemia. Ultraschall Med 1991;12:74–79. Becher H, Schlief R. Improved sensitivity of color Doppler by SH U 454. Am J Cardiol 1989;64:374–377. Otis S, Rush M, Boyajina R. Contrast-enhanced transcranial imaging. Results of an American phase-two study. Stroke 1995;26:203–209. Bogdahn U, Becker G, Schlief R, Reddig J, Hassel W. Contrast-enhanced transcranial color-coded real-time sonography. Results of a phase-two study. Stroke 1993;24:676–684. Ries F, Honisch C, Lambertz M, Schlief R. A transpulmonary contrast medium enhances the transcranial Doppler signal in humans. Stroke 1993;24:1903–1909. Rosenkranz K, Zendel F, Langer R, et al. Contrast-enhanced transcranial Doppler US with a new transpulmonary echo contrast agent based on saccharide microparticles. Radiology 1993;187:439–443. Lindegaard KF. Intracranial artery stenosis. In: Newell DW, Aaslid R, eds. Transcranial Doppler. New York:Raven Press, 1992:161–166. Ley–Pozo J, Ringelstein EG. Noninvasive detection of occlusive disease of the carotid siphon and middle cerebral artery. Ann Neurol 1990;28:640–647. De Bray JM, Joseph PA, Jeanvoine H, Maugin D, Dauzat M, Plassard F. Transcranial Doppler evaluation of middle cerebral artery stenosis. J Ultrasound Med 1988;7:611–616. Bastianello S, Pierallini A, Colonnese C, et al. Hyperdense middle cerebral artery CT sign. Comparison with angiography in the acute phase of ischemic supratentorial infarction. Neuroradiology 1991;33:207–211. Gács G, Fox AJ, Barnett HJ, Vinuela F. CT visualization of intracranial arterial thromboembolism. Stroke 1983;14:756–762. Leys D, Pruvo JP, Godefroy O, Rondepierre P, Leclerc X. Prevalence and significance of hyperdense middle cerebral artery in acute stroke. Stroke 1992;23:317–324. Itoh T, Matsumoto M, Uchimoto R, et al. Perfusion imaging of the brain by B-mode ultrasonography. An experimental study in rabbits. Stroke 1995;26:2353–2356; 2357 [Discussion]. Goldberg BB, Liu JB, Burns PN, Merton DA, Forsberg F. Galactose-based intravenous sonographic contrast agent : experimental studies. J Ultrasound Med 1993;12:463–470. Baumgartner RW, Arnold M, Gonner F, et al. Contrast-enhanced color-coded duplex sonography in ischemic cerebrovascular disease. Stroke 1997;28:2473–2478. Martin PJ, Evans DH, Naylor AR. Transcranial color-coded sonography of the basal cerebral circulation. Reference data from 115 volunteers. Stroke 1994;25:390–396. Kenton AR, Martin PJ, Abbott RJ, Moody AR. Comparison of transcranial color-coded sonography and magnetic resonance angiography in acute stroke. Stroke 1997;28:1601–1606. Korogi Y, Takahashi M, Mabuchi N, et al. Intracranial vascular stenosis and occlusion : diagnostic accuracy of three-dimensional, Fourier transform, time-of-flight MR angiography. Radiology 1994;193:187–193. Stock KW, Radue EW, Jacob AL, Bao XS, Steinbrich W. Intracranial arteries : prospective blinded comparative study of MR angiography and DSA in 50 patients. Radiology 1995;195:451–456.